No question about it, Real Madrid dominated the traveling championship in Spanish soccer this season, and now has the all-time lead, holding the championship for 37 games. Barcelona, which dominated the traveler last year, is second with 30. Christiano Ronaldo keeps taking Real Madrid higher. 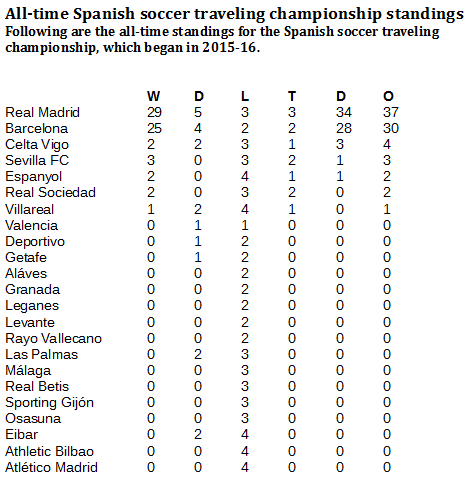 Real now is the all-time leader in the Spanish soccer traveling championship (Chris Deahr/Creative Commons Attribution 2.0 Generic license). In Spain, it goes back and forth between Barcelona and Real Madrid. The last three seasons have seen those clubs finish in the top two in La Liga, never with a margin exceeding three points. This season, which ended Sunday, found Real Madrid on top of those standings, the first time Real has won the league since 2012. The Spanish traveling championship, which has a much shorter history, tracks about the same way. Real Madrid is the Team of the Year, much due to its great start. Real Madrid entered the season with the traveling title, which it won on April 2, 2016, with a 2-1 win against Barcelona at home. 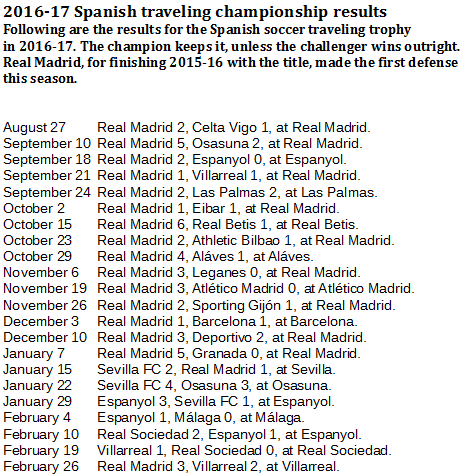 Real defended that title seven times ending the 2015-16 season, then tacked on 15 more title defenses at the start of 2016-17. With that start, and another title with eight defenses later in the season, Real Madrid surpassed Barcelona as the all-time traveling champion. But the lead isn't large. And Barcelona holds it now, which means it will take the title to the 2017-18 season. Barcelona took the title from Real Madrid on April 23 with a 3-2 win at Real Madrid. Five title defenses later, Barcelona is catching up. 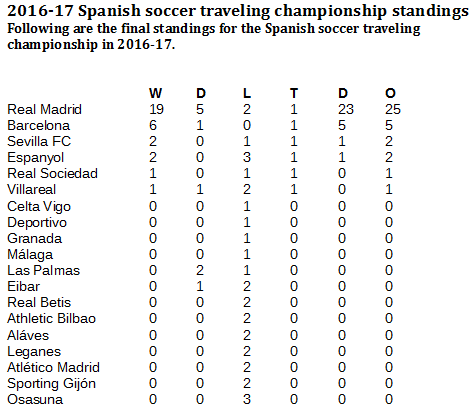 Two years into the traveling championship, Real Madrid has held the title for 37 games, with Barcelona in second place at 30. 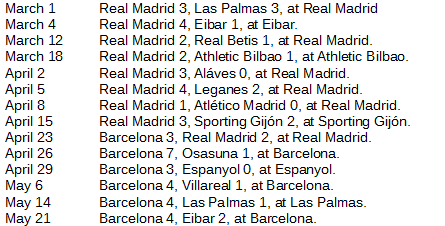 No other team in Spain has held the title for more than four games.